It might seem silly to many people, but my most prized possession is a stone ax that my son- in-law found while he was deer hunting near Killeen, Texas. Walking down a dry riverbed the unusual shape caught his eye and he picked up the rock. He had no background in archaeology or anthropology, but intuitively recognized it as manmade. A few weeks later, I spotted the rock in his backyard. He gave it to his kids and they discarded it under a tree. When I picked it up, I was amazed. It fit into my left hand perfectly, shaped with a subtle indentation for my thumb to fit comfortably. The edge was sharp and the chips that were struck off to form the blade were clearly visible. It looked exactly like blades illustrated in Anthropology books used in my college courses years ago. A friend who has a friend who is an archaeologist affirmed that the ax was, indeed, a product of pre-Columbian Paleo Indians, but that is about all I could find out about the relic. The earliest people migrated into the Americas between 45M and 15M years ago when the oceans retreated and a land mass formed across the Bering Sea that animals could migrate across and men could follow them. Around eight thousand years ago, the glaciers had receded and the climate stabilized giving the new comers a chance to thrive, foraging and hunting musk ox and mastodon. It is hard to date the ax without stratification. Dating is also complicated because Native Americans never progressed out of the Stone Age. It is amazing, but the Woodland tribes, Plains tribes, and Pueblo tribes were still living in the Stone Age when Europeans came to America. Even the mighty empires of the Incas and Aztecs were in the Stone Age culturally. However, the odds are that this artifact is thousands of years old. 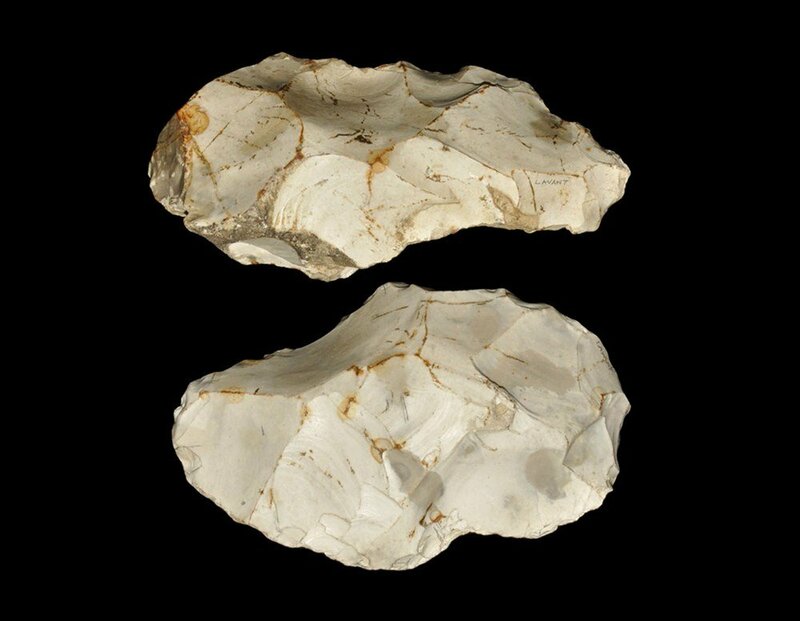 The style and shape of this ax is very much like Paleolithic ones found across Europe dating over 100,000 years ago. What’s the thrill for me? There are not words to explain the subtle thrill to hold a tool that was (most likely) used by a hunter eight or ten thousand years ago to clean a mastodon hide, a man like me with a family, thoughts and dreams, and hope for the future.